The New York Police Department is an iconic symbol of one of the world's most famous cities. The blue uniforms of the men and women who serve on the force have long stood for integrity and heroism in the work to serve and protect the city's residents. Unfortunately, due to sales rights restrictions, we cannot offer NYPD's First Fifty Years for sale in your country. The New York Police Department is an iconic symbol of one of the world's most famous cities. The blue uniforms of the men and women who serve on the force have long stood for integrity and heroism in the work to serve and protect the city's residents. And yet, as in any large public organization, the NYPD has also suffered its share of corruption, political shenanigans, and questionable leadership. In The NYPD's First Fifty Years, Bernard Whalen, himself a long-serving NYPD lieutenant, and his father, Jon, consider the men and women who have contributed to the department's past, both positively and less so. 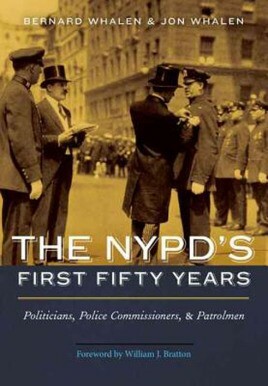 Starting with the official formation of the NYPD in 1898, they examine the commissioners, politicians, and patrolmen who during the next fifty years left a lasting mark on history and on one another. In the process, they also explore the backroom dealings, the hidden history, and the relationships that set the scene for the modern NYPD that so proudly serves the city today.